Have you seen the planet Mercury after sunset yet? If not, what are you waiting for? 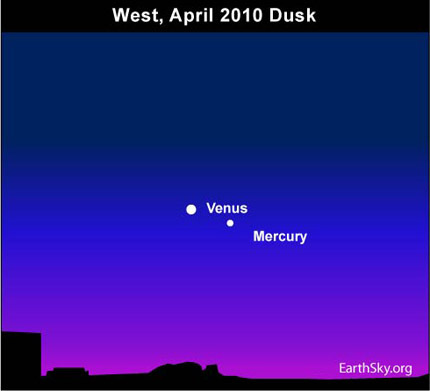 The first week of April presents your best chance to catch Mercury in all of 2010. Mercury is rather easy to spot right now, because it shines right next to the blazing planet Venus. Since Venus is the brightest celestial object after the sun and the moon, you should have little trouble seeing Venus low in the west some 30 minutes (or less) after sunset. Look for Mercury next to Venus. If you can’t see Mercury with the unaided eye, use binoculars. Mercury and Venus readily fit within a single binocular field. Technically speaking, Mercury and Venus are not in conjunction, even though they are only 3 degrees apart. 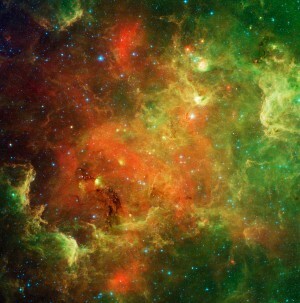 (A finger-width at an arm length measures about 2 degrees of sky.) To be in conjunction, two planets have to be north and south of one another. When two planets are within 5 degrees – yet are not aligned north and south – it is called a quasi-conjunction. Look for Mercury and Venus about 30 to 75 minutes after sunset but before it gets good and dark. Mercury and Venus follow the sun beneath the horizon about 1.5 hours after sundown. Site contents copyright © 2019 Recorder Online	except as noted. All rights reserved. | 88 queries in 2.210 seconds.